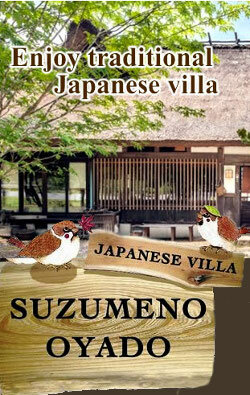 “SUZUMENOOYADO” is traditional thatches roof private-house located north of Kyoto,50 min. by car. It is enjoyable for both families and friends. You can rent the whole house,so that you are able to experience the traditional Japanese life style without disturbance.Available not only for overnighters with family up to 10 guests but also for day-trippers in spare time from leisure activities. You can enjoy B.B.Q / golf / fishing / in summer,skiing / snow-board / hot spring / in winter.Please have a happy and relaxing time in “SUZUMENOOYADO”. 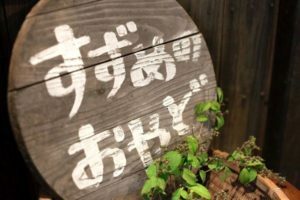 A mountain village,Katsuragawa which carries mackerels from Wakasa to Kyoto and spreads along National Road No.367 called “Mackerel Road” in the old days. The villa suzumenooyado located at the northernmost tip of the area, and the thatched roof that appears in the majestic nature creates a world like “Japanese old tale”.